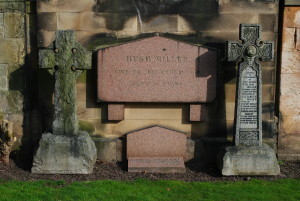 Hugh Miller is well known as the stonemason and self-taught geologist and palaeontologist who published his geological findings in the book “The Old Red Sandstone” in 1841. His world famous fossils can be seen in museums in Cromarty, Elgin and the National Museum of Scotland. He was also a devout Christian, who joined the Free Church of Scotland in 1843. He moved to Edinburgh as the editor of an associated, influential newspaper, The Witness, in which he wrote on social issues. Apparently suffering from depression in 1856, he committed suicide in December of that year. An outstandingly well attended funeral procession took him to a grave near that of Chalmers and other Free Kirk luminaries. Hugh Miller was born in Cromarty in 1802. He married Lydia Falconer Fraser (1812-1876), herself a writer, and they had five children. After his death, Lydia devoted much of her time to getting her husband’s work recognised and published. Hugh Miller’s headstone is a plain block of stone simply inscribed HUGH MILLER DIED 24 DECEMBER 1856 AGED 54. Nearby are three other monuments dedicated to members of his family. To the left is that of his younger son, Hugh Miller FRSE (1850-1896). To the right is a Celtic cross commemorating his elder son, Lieutenant Colonel William Miller (1842-1893); his daughter Elizabeth (1845-1919) who married the Rev Norman Nicolson Mackay; and their son Norman Nicolson Mackay (1886-1916) who was killed in the First World War. At the base is Captain William Henry Miller (1887-1920), the son of William Miller. Beneath Hugh Miller’s monument is a small stone commemorating Lydia, and the Rev Callum N Miller Mackay (1879-1945). He is probably the son of Elizabeth and Rev. N.N. Mackay, and therefore Hugh Miller’s grandson.